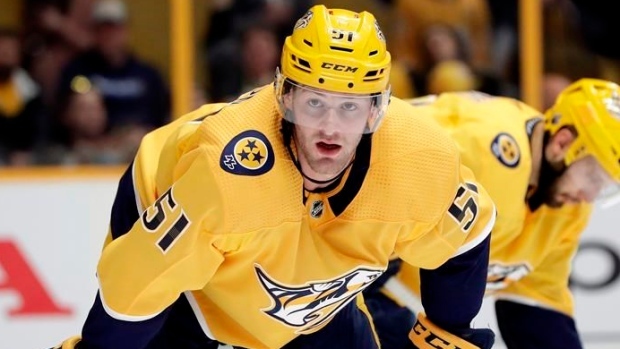 The NHL and NHLPA announced Monday that Nashville Predators forward Austin Watson has been returned to available status and has entered the follow-up care phase of the Substance Abuse and Behavioral Health program. On. Jan. 29, Watson was placed in stage two of the SABH for ongoing issues with alcohol abuse. Watson, 27, was suspended last summer for 27 games and the entirety of the preseason following a no-contest plea to a domestic assault charge involving his girlfriend in Franklin, TN. An independent arbitrator later reduced Watson's suspension to 19 games. The 27-year-old has appeared in 34 games this season, recording 13 points (seven goals, six assists). The Predators are second in the Central division.